Throughout the Scriptures, God reveals Himself to humanity as Father. Sadly, the examples many people have in their earthly fathers have negatively affected their ability to comprehend God as Father. At Engage Calvary, we hope to help change that through our Men’s Ministry. Our desire is that our Men’s Ministry would engage the men in our church where they’re at with the Word of God in very practical ways and equip them to become Godly leaders in the church, home and community. We hope that you will consider connecting with our Men’s Ministry to grow in your faith and walk with Jesus in both word and deed. 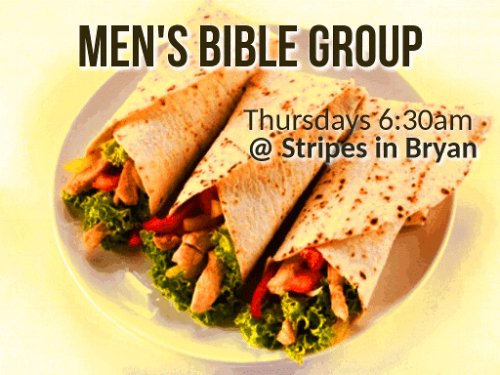 Meets every Thursday morning at 6:30am at Stripes at 600 N Earl Rudder Fwy in Bryan for fellowship, encouragement and prayer. Contact Josh Thorn at josh@engagecalvary.org for more information.